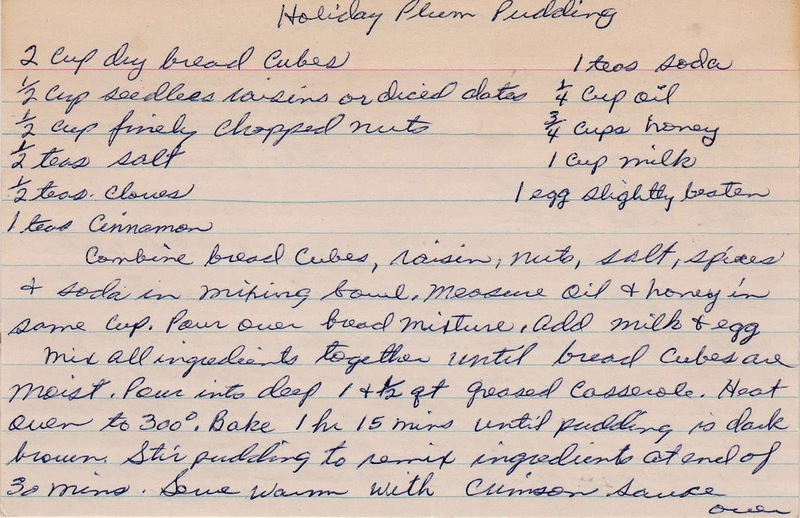 Growing up Jewish in the midwest, and even living here in New York City, I had never before laid eyes upon plum pudding (much less tasted it) before I made this vintage version on Sunday. I'm pleased to report it is delicious and was a big hit at our belated family potato latke party. 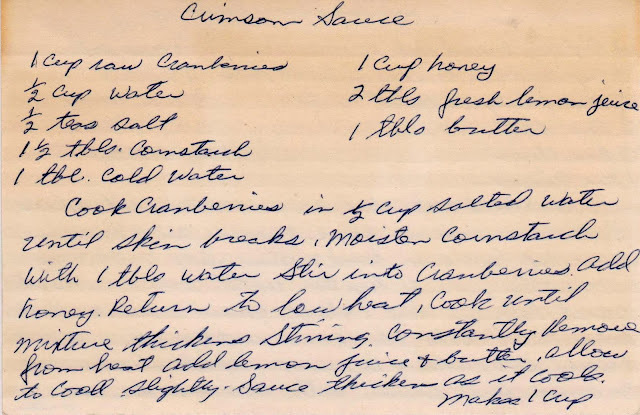 The c. 1950s American recipe I used does not appear to be traditional, as most plum puddings are baked in a mold, then turned out from said mold, doused with alcohol and flambeed in the kitchen, or table side for a dramatic presentation. But I do think this version has the ability to be baked and presented that way. 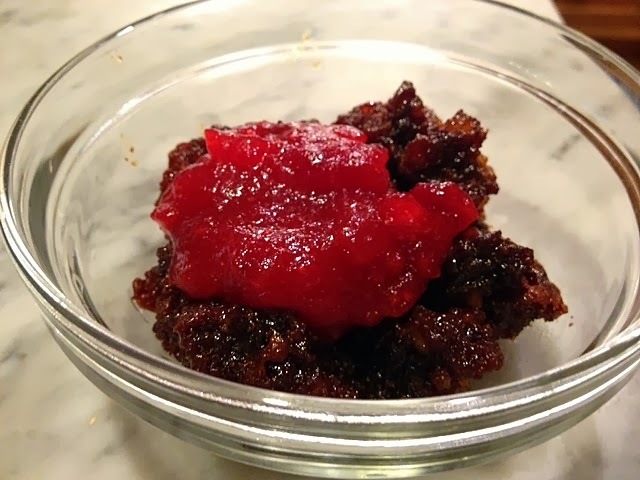 I also was astonished to discover that plum pudding (also called Christmas pudding) contains no plums; the name refers to raisins, which is apparently what the British called plums when this dish was created in medieval England. 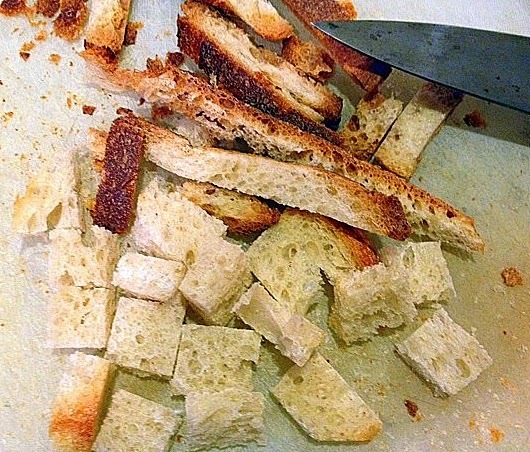 It is also more of a cake than a pudding, and also has no flour -- relying on bread cubes instead. 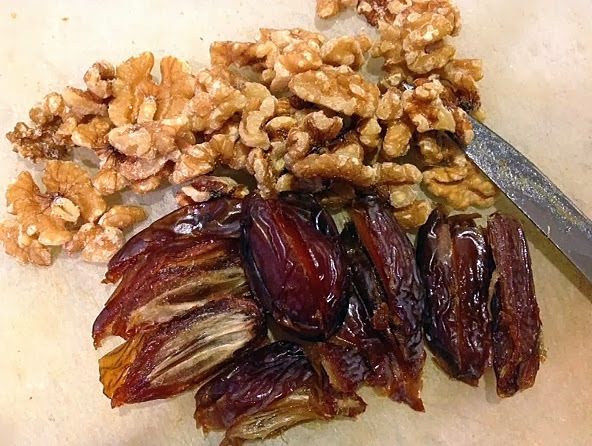 Chop some walnuts (the recipe called for "nuts" which often refers to walnuts in vintage recipes) and breaking from tradition, this recipe offered a choice of raisins or dates. Not being a raisin fan, I used dates. 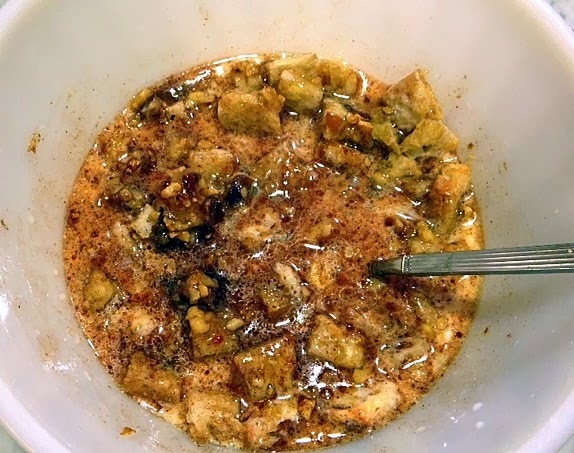 Mix all the ingredients in a bowl before pouring into a buttered casserole dish. My pudding runneth over during baking (and I've yet to summon the courage to face the floor of my oven, but soon!). Place the dish on a cookie sheet or some foil before baking to prevent such tragedy in your own oven. 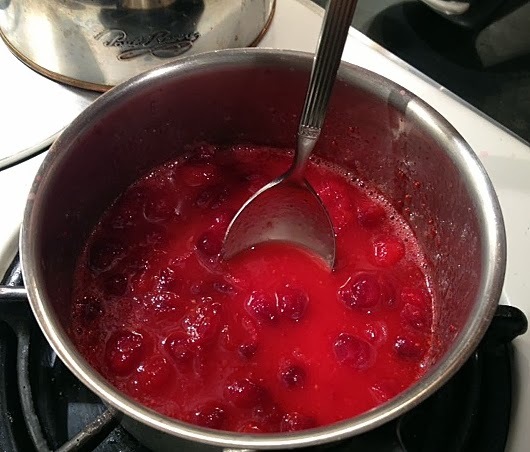 While the pudding is ruining your oven baking, start the crimson sauce, a bright combination of cranberries, honey, butter and fresh lemon juice. I'm not sure when the switch from plums to raisins happened, but I can tell you that the Brits still use pudding as a general term for dessert. Hence plum "pudding." In my experience, plum pudding is doused in rum sauce. Personally, I like the idea of cranberries much better. I think this looks very good and I have never had plum pudding either. 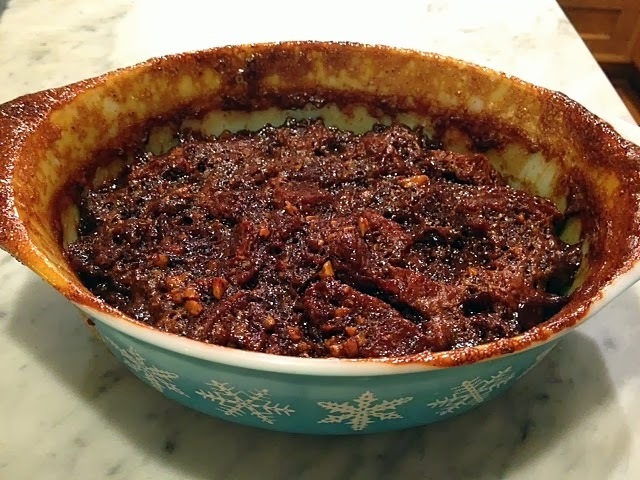 This looks perfect though to serve after latkes, maybe with a few rugelach on the side!